Well, hello! Welcome to August. Can you believe it? NUTS! Right? It’s time for the new daily download!! Before I do, I thought I’d let you know that we’re changing things up with the daily download. No, don’t worry, we’re not doing anything major, just how we’re going to show it off!! With the preview, sometimes you don’t know if you’re going to like the kit. Well, now, we’re going to show off some layouts, at least once a week! You’ll be able to see exactly what’s coming, based on the layouts. Now, I can’t show you August’s amazing kit, I have to show off July’s, in full!! 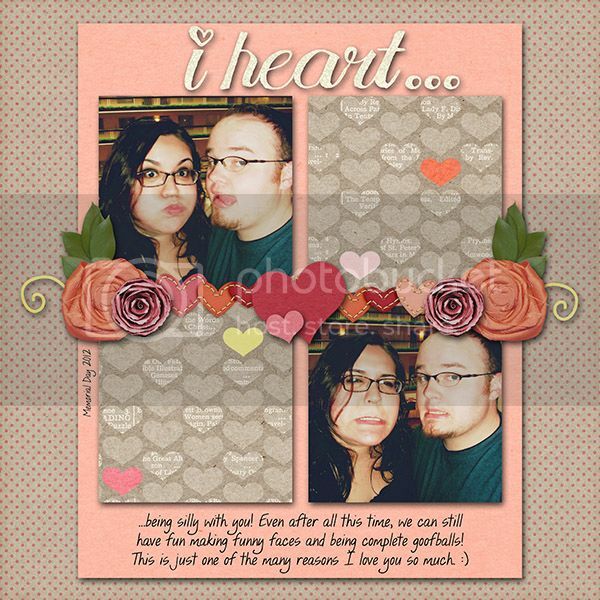 Terra, of Sugar Kissed Designs did an amazing job on July’s kit. I’ve been craving ice cream since I saw it, and well, you might too!! See, the kit is SO much cuter than that sneak peek could ever do justice for!! Now! What you’ve truly been waiting for!! 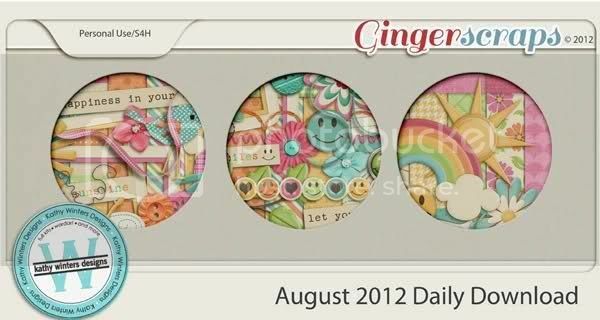 Kathy Winters has created August’s Daily Download! Oh my goodness! It’s GORGEOUS!! It’s so bright, sunny, and airy. Just beautiful!! Okay, who else is doing double-takes at the title of this post? Is it really already July? :O Where did June go? I don’t know about you, but I think 2012 is flying by way too fast!! I’m excited to see what the next half of 2012 is going to off, though. That includes a new daily download for July! Before I show it to you, though, I am ready to show off June’s official preview! First, can we give out a huge thank you to Jennifer, of Luv Ewe Designs, for her amazing kit that she had for download every single day of June? She created Sky’s the Limit, and it was seriously so cute! I could tell by the comments that you all really enjoyed the kit!! It’s now available in the store! If you missed any pieces, you can get the whole kit! 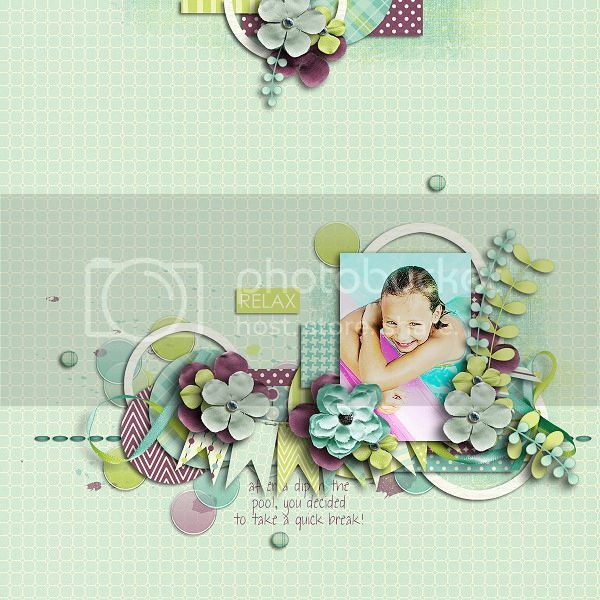 Now, I’m super thrilled to share this month’s Daily Download designer! You’ve probably caught at least one of her Friday Late Night Scraps (if you haven’t, you need to ;)). If you guessed Terra, of Sugar Kissed Designs, you couldn’t be more right! The kit she designed for July is ADORABLE in all the right ways! Well, I’ll see you tomorrow with another piece! Enjoy! Team Spotlight: Terra – Sugar Kissed Designs! Today we get to chatty chat with someone a lot of you already know, Terra! 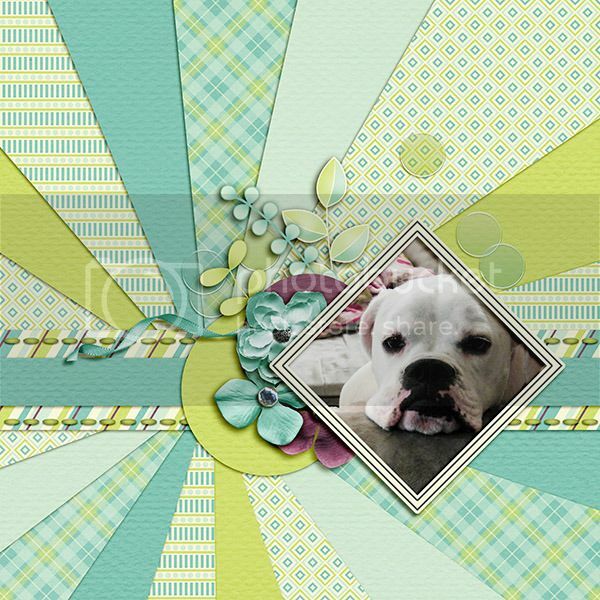 Designer of Sugar Kissed Designs, host of our Friday Night Owl Scrap&Chats and all around awesome lady! OH! And she is hosting this months Daily Download! Awesome? Yup. I’m 35 and I was born and raised in Arizona… I took a detour up north and lived in Minneapolis for a few years, and honestly feel like I’m more from Minnesota than here. I have a dog and a cat that sleep on either side of me and take up most of my bed! As far as hobbies, I love gardening and cooking. I’m very into the whole foods movement. What got you designing? How did you start? I started as a designer for taggers. And then I participated in a designer contest and was SOOO unprepared! Designing at 300 dpi is much different than designing for web use. However, I think that contest and the encouragement I received from other designers in the community really spurred me on and helped boost my own designing confidence. Well, I can safely speak for the general public, that we’re happy you gained that confidence because your designs are lovely! Speaking of, your kits- Do you still have your first? Your favorite and your bestselling? Oh this is a hard question. I think my favorite kit is the first one I ever made for Ginger Scraps “Home”. 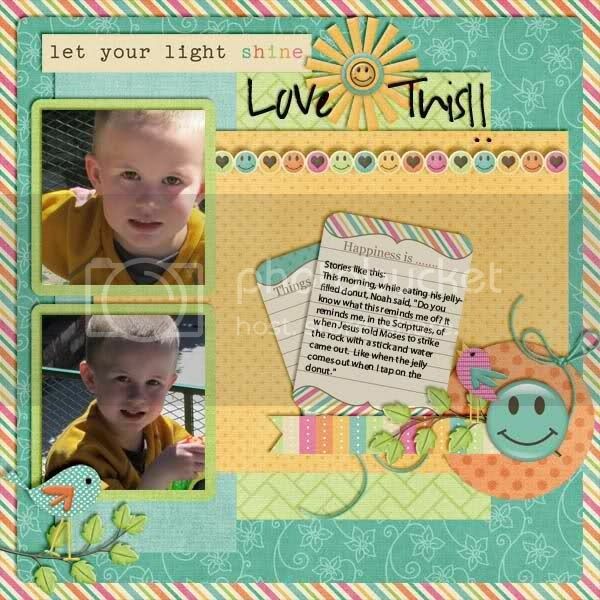 I Love EVERY layout I see made with it! I know I’ve said this before, and I mean it each and every time, but I absolutely love ALL three of those kits! I’ve been wondering what to use my March challenge rewards on, and I am really really really eyein’ up that Home kit now. All kits are available still in the store, each image preview is linked. More about your designing Terra, what inspires these beautiful kits? All kinds of things! Music is a huge inspiration when it comes to ideas though! What is the one thing you can’t do without when designing: be it music, coffee, quiet, specific software, any one thing you can’t live without! I can’t design without Illustrator and Photoshop! I love illustrator and the freedom it gives me to create items by hand. What is your advice for aspiring designers? I tend to hum and sing a lot. Your most favorite book turned movie ? That response had me jumping out of my seat (almost literally), ME TOO ME TOO ME TOO! I just love all things Alice in Wonderland! I mean looooooooooooove! Willy Wonka… I think our country would be far more tasty and hopefully we’d all get a personal oompa loompa as part of his campaign promise! Lastly, after a long day, what is your favorite drink ( anything from coffee to juice to soda to a glass of wine)? So now you know, Terra likes to hum and sing, drink water with Lemon and every layout made with her Home kit. You know what that means? It’s Saturday morning, you’re probably still in your jammies (I know I am!) so what’s more awesome than putting your feet up and shopping?! Check out that Home kit, and her other great designs at her shop! Make sure to join our Friday Night Owls Scrap & Chat too! There’s always lots of chatting, fun and even goodies! Don’t forget to check back every day for the April Daily Download either! May your coffee be bottomless, and your slippers fuzzy!